Dr. Pradeep K. Sinha is board certified in otolaryngology, as well as facial plastic and reconstructive surgery. Dr. Sinha treats all aspects of ear, nose, and throat problems, and has a special focus on rhinology and facial plastic and reconstructive surgery. 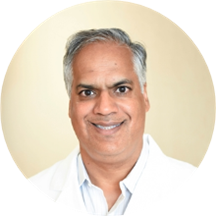 Dr. Sinha is the founder of both the Atlanta Institute for ENT and a successful facial aesthetic surgery practice. Dr. Sinha enjoys rhinology specifically because of the ability to use advanced instrumentation and technology to cure common, but chronic breathing conditions. His motivator for practicing facial aesthetic surgery is the opportunity to combine artistic perception with scientific methods to help others look just as good as they feel. Dr. Sinha received his undergraduate degree from University of Cincinnati College of Arts & Sciences, and his medical degree from University of Cincinnati College of Medicine. He completed an internship at University of California, Los Angeles, followed by a residency at Wayne State University in Detroit. He is certified by the American Board of Otolaryngology and the American Board of Facial Plastic and Reconstructive Surgery. He is a fellow of the American Academy of Otolaryngology – Head and Neck Surgery, a fellow of the American Academy of Facial Plastic and Reconstructive Surgery, and a fellow of American College of Surgeons. He is a member of the American Medical Association, the Medical Association of Georgia, and the Medical Association of Atlanta. Dr. Sinha is originally from Cincinnati, Ohio, but moved to Atlanta more than fifteen years ago, drawn to the city’s great opportunity and temperate weather. When not in the office, Dr. Sinha spends quality time with his wife and three children.